All those photographs, and you couldn't link to at least one? You know what I just learned last week. Exactly that. At last the truth comes to light... he won't be soon forgotten, except now the buzz is about Glenn Frey. Glenn who? Bowie is still trending in my feed, although Frey has hit as well. I finished the documentary on Netflix about the Eagles. I hate to speak ill of the dead but Frey came off as a coked-up bully. Pretty much unfairly kicking two members out of the band in order to consolidate power and hijack the band. Made Axel Rose look like Ghandi. I always thought Bowie played all the guitar parts on the Album "Diamond Dogs".Correct me if I am wrong. I think Robert Fripp once said something like this: there is no sadness in a life well-lived, but there is loss. So my thought is that Bowie was a great talent who gave us much, but his life came to a natural end. We should appreciate his work but he's gone and that's life. Bowie played all guitars on the entire Diamond Dogs album minus one song. I think it was 1984 that one other guitar player helped play some of the guitar, (Alan Parker). There is more 1984/Dodo info, but I think the previous is enough. I did like that Supro Bowie played. He was a very good guitar-songwriter/music writer, much more than being a guitar wizard. To me, songwriting is more important anyway. It is my understanding that Alan Parker played that. Bowie certainly wrote it. There is a story of Bowie in a hotel room being driven mad by some-one in another room continuously playing the Rebel Rebel riff incorrectly at high volume. After a few hours D.B had had enough & knocked on the door of the offending room. It was answered by tennis player John McEnroe, guitar in hand. Supro David Bowie Limited Edition Dual Tone with bigsby, available as a hardtail as well. And it automatically makes you look as cool as Bowie the minute you strap it on! I just sold my '62 because as long as I've had it, I'll never be as cool as Bowie. 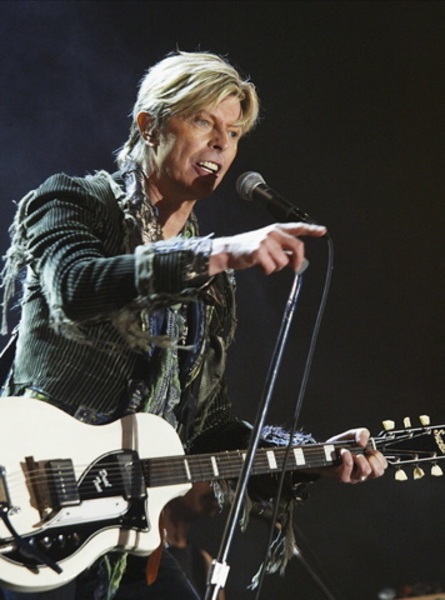 Those old Dual Tones, like Bowie played are really nice, i've never seen a new one but ive played lots of oldies. The Val Trol is another great one, that piezo bridge pickup is a trip. Actually...my Dual-Tone is one of the biggest POS I've ever owned. My $99 Epiphone LP Special blows it away. And look at the back...neck held on with 2 screws?!?!?! One is a TILT ADJUSTMENT and the neck is held on with ONE SCREW. And the frets are tiny...like a mandolin. I have, and have had, some weird, funky guitars. The vast majority I can make play well and stay in tune. The Dual-Tone is a slide-only guitar for me. BTW...the new Supro did a great job reproducing this pickup. I’m witchu, Vince. The differences between the original and the Airline are subtle; a little in the upper side waist, an apparent slight revision of the cutaway, elongated lower body. Aesthetically, the original is slightly more pleasing to me. The differences between the original and the new one are glaring and not at all subtle. Cutaway, upper shoulder, both waist cuts. It’s all close enough to get sued over, if that body shape was being protected by anyone - but not even close in a rudimentary survey of the profile. And, yeah, why? Nothing about it is an aesthetic improvement. In its own humble way, the original is both “iconic” and perfectly shaped and proportioned. Why not just trace the shape and honor it? Thanks Tim, I was wondering if it was just me! I prefer the original also out of the three, with the naughty Airline coming a close second. I'm just puzzled as to why the new reissue is so 'squat' and to me, not so pleasing to the eye. I guess folks have to add something to make it new, but it ain't broke, don't fix it! Making the neck and frets more playable makes total sense, that's what the Airline vagabonds have done. I have the Roadhouse Vista Tone pickup in one of mine (same folks who make the pups for the new models) so I'm guilty of joining the pirate ship! Wildeman here, i tried to put some cool pix up a couple posts ago, lemmy try again.